While reading another book by Dallas Willard, I ran across a reference to this book by Frank Laubach. 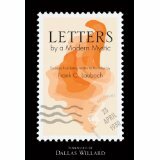 Laubach was a missionary to the Philippines in the 1930s and this book is a collection of his letters written to his father back in the States. In his letters Laubach describes his attempt at a rather simple, but daunting experiment: to – quite literally – bring God to mind every minute of every day. I was personally intrigued by the contrast of this experiment. On one hand it is the simplest of concepts; on the other it is a virtual impossibility, much like the biblical command to “Be perfect, as I am perfect.” Sure, no problem! Several of Laubach’s comments struck me. Concentration is merely the continuous return to the same problem from a million angles. We do not think of one thing. We always think of the relationship of at least two things, and more often of three or more simultaneously. So my problem is this: can I bring God back in my mind-flow every few seconds so that God shall always be in my mind as an after image, shall always be one of the elements in every concept and percept? I choose to make the rest of my life an experiment in answering this question. This is something that Dallas Willard refers to and I believe it is a sizable hurdle to overcome in following Jesus. It is the realization that we do not think about only one thing at a time, but usually we are thinking of multiple things at once. Go ahead – record your thoughts over the next five minutes. When we realize this, we can overcome the common objection that we cannot think about God … and work … and watch TV … and get the kids ready for bed. Accepting that we can – and do – recall multiple things to mind each and every minute allows us to simply make God one of those reoccurring thoughts. The most wonderful discovery that has ever come to me is that I do not have to wait until some future time for the glorious hour. This sentiment is one that I desperately want to believe: that we need not wait for heaven to experience God’s kingdom. It has been my own experiment over the last five years and it has proven both challenging and elusive. But I believe it is possible. It is here that Laubach offers another small discipline in living out this reality. This experiment which I am trying is the most strenuous discipline which anyone ever attempted. I am not succeeding in keeping God in my mind very many hours of the day, and from the point of view of experiment number one, I should have to record a pretty high percentage of failure. One of the things I appreciated most about this little book was Laubach’s honesty about his own struggles and failures at this experiment. I admit that I haven’t fully immersed myself in this particular experiment, but I have been more aware of my thoughts and what a daunting challenge this actually becomes to live out. Yet with each failure, Laubach reminds us that each minute brings the opportunity to start fresh again. And isn’t that what grace is all about?